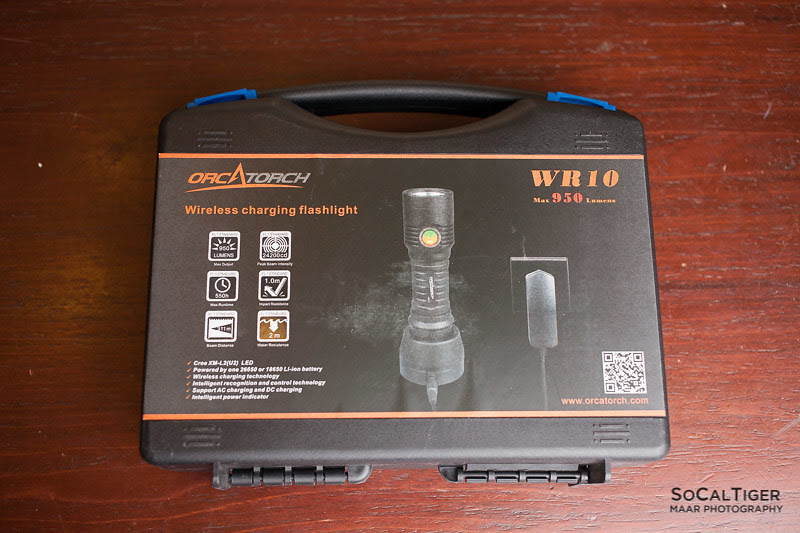 The Orcatorch WR10 is Orcatorch's premier wireless flashlight and one of the few flashlights with wireless-charging capability. The WR10 is powered by 1x26650 (includes a 1x18650 sleeve) and utilizes a domed Cree XM-L2 U4 in a polished reflector with a throwy beam. Output is speced at a max of 950 lumens and there is also a 2 lumen low mode. I was provided a copy for review by Orcatorch (also known as Outdoor Equipment Expert and Odepro Outdoors). The WR10 arrived in a nice plastic case with cut-to-fit padding. However, the padded cut-outs are only on one side so the contents may come out of their slots during shipping. Accessories included a charging base (with both a wall plug and car plug), 26650 battery, 18650 sleeve, 2 spare O-rings and manual. 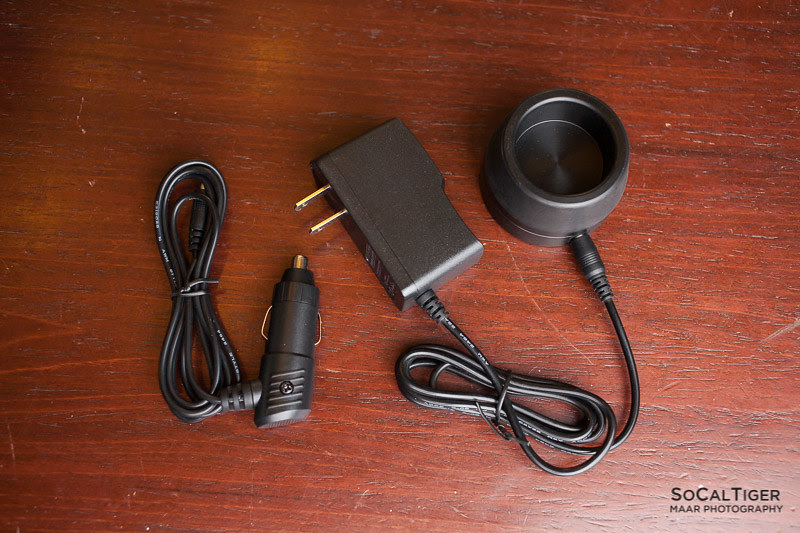 Included wireless charger base with both wall and car adapters. 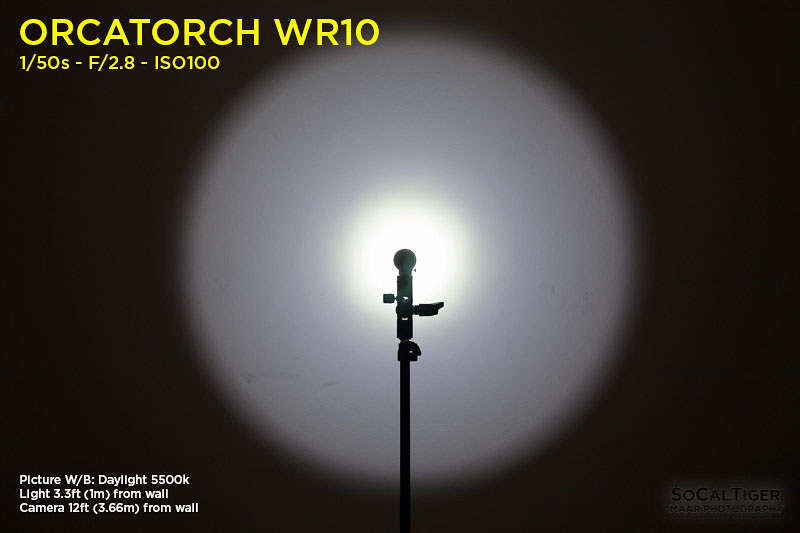 The WR10 has smooth low-gloss black anodizing. The anodizing was applied well and my copy did not have any notable defects in the finish. I feel that this finish looks very nice and professional in quality. The body of the light is a nice 1x26650 design. Due to the design, there is no roll-resistance. The body has a subtle pattern which looks nice and adds grip. The pattern feels good in hand and is not aggressive or sharp at all. The WR10 can tail-stand perfectly. There is no lanyard attachment point at the base due to the wireless charging interface. The threads were cut perfectly square but are not anodized. Wireless charging. This works using induction, the same way that wireless toothbrushes work. The light is controlled solely by the side-switch. To turn STROBE ON, long-press side switch. To switch between STROBE and SOS, long-press side switch again. To exit STROBE/SOS, press side switch (will return to previous mode). Comments: I like the simple UI and I LOVE how Strobe & SOS are hidden. IMO, this is the perfect/ideal way to hide those modes. There is no risk of accidentally entering those modes by clicking too fast. Measurements were done using the included 26650. I estimate that the High spec for High is correct. Medium and particularly Low provided more output than specified. 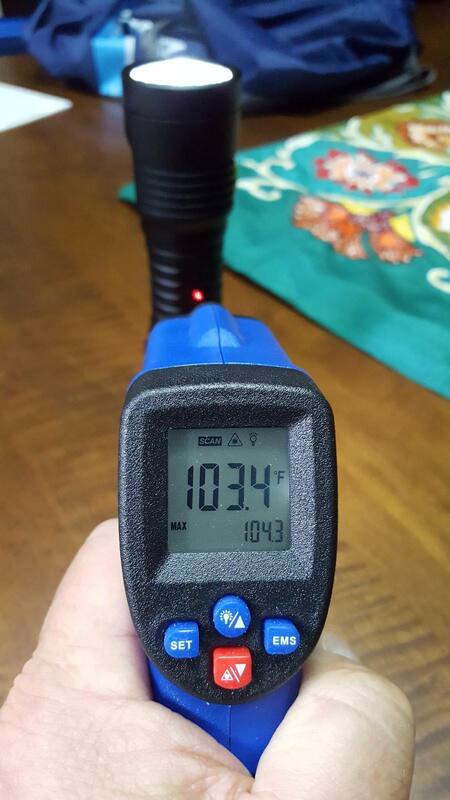 I measured Low at 12 lumens, which is fine for my usage. Throwy. 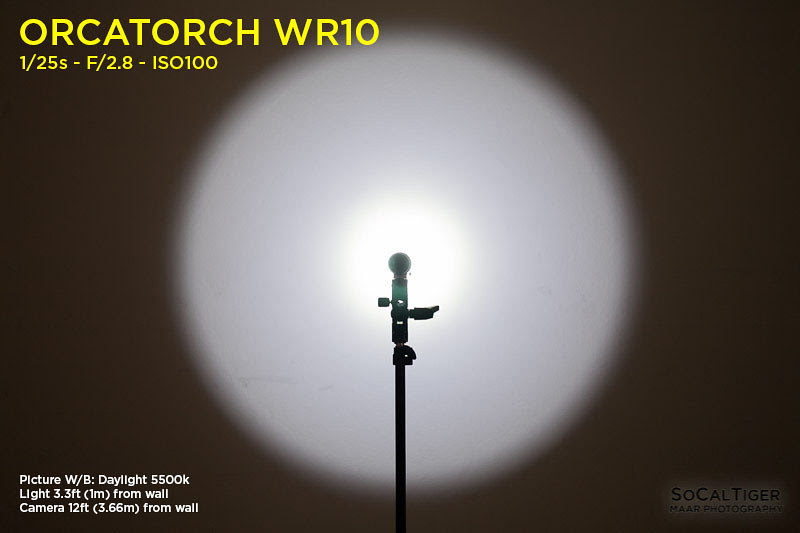 The WR10 uses a domed Cree XM-L2 in a polished reflector. The beam has a defined hotspot but with a nice amount of spill. 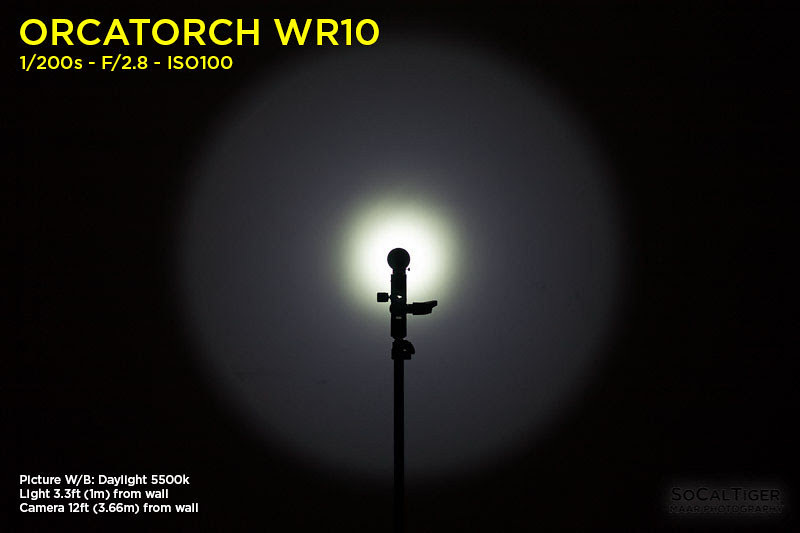 The WR10 is a cold to neutral white at 6000K. When white-balanced in Adobe Lightroom against "Daylight 5500K", and in practice, the beamshots appear cool. I would like if there was an option for a warmer light in the 4500K range like the XP-L2 V6 3D. Tint/Green shift: When compared against Daylight WB in Lightroom, this light had +4 green shift. I consider this normal and not noticeable in practice. I have observed a range between -10 (rosy) to +20 (greenish) among LED lights. You cannot physically lock-out the light by loosening the head/body to break the circuit. If there is a possibility of accidental activation, you should remove the batteries as the side-switch is relatively easy to activate.. 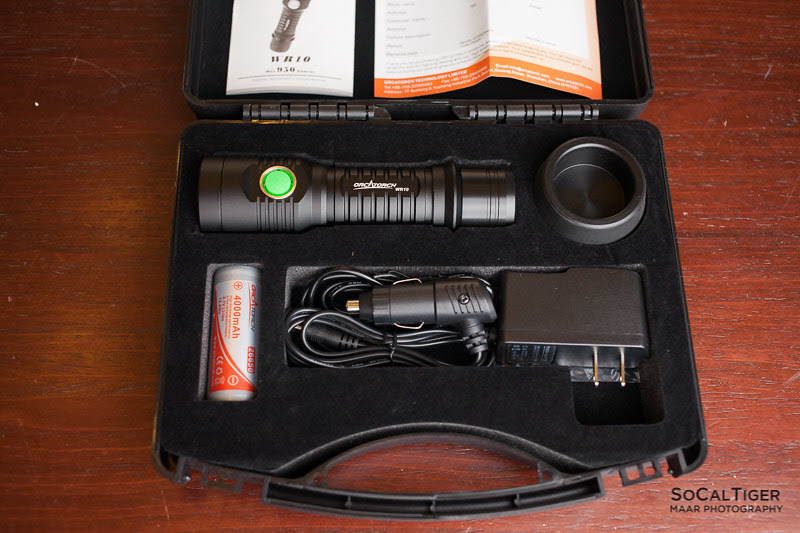 This is a very nice 26650 light with a good "medium" size and good output speced at around 950 lumens. 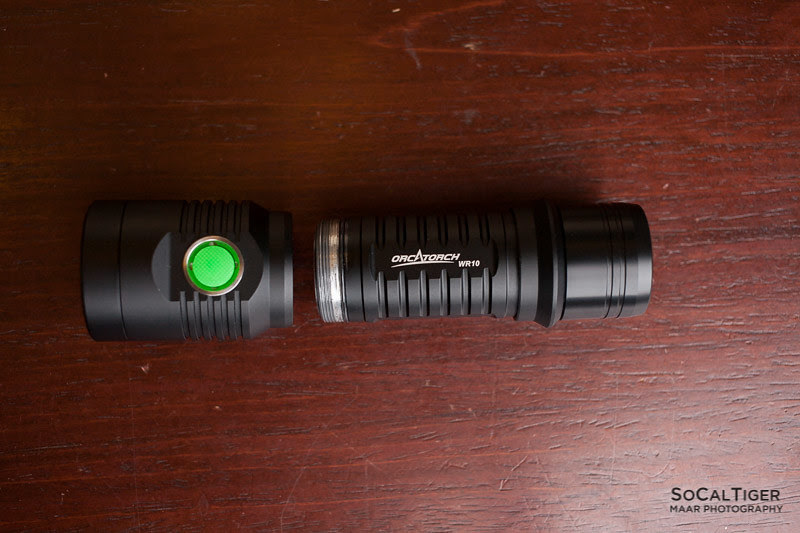 The mode spacing is also good at roughly 100% > 45% > 9% > 1% and the Low was measured at a usable 12 lumens. 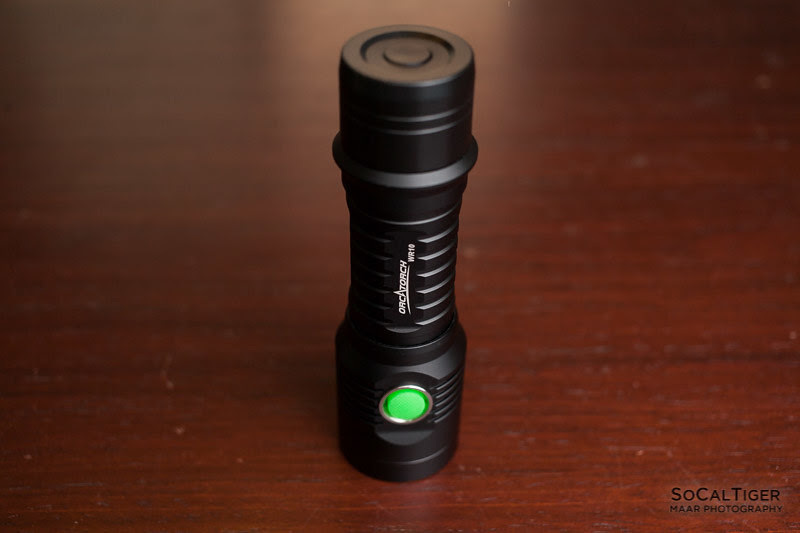 What sets this let apart from most Li-Ion flashlights is the ability to charge the battery wirelessly using an inductive charging base. 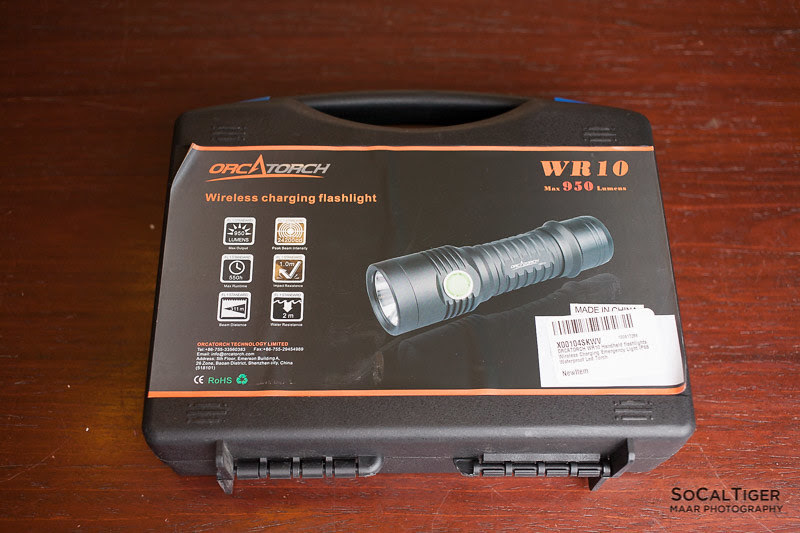 In addition to this, you can charge non-proprietary batteries in this flashlight, unlike some other wireless flashlights. 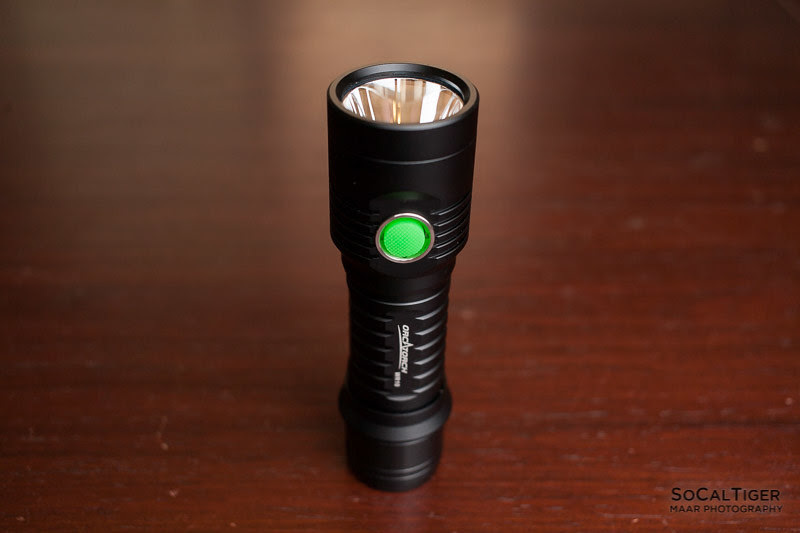 Sized as a 26650 flashlight, this type of light is best used in larger pockets (like a jacket) or put in laptop bag/glovebox/etc. 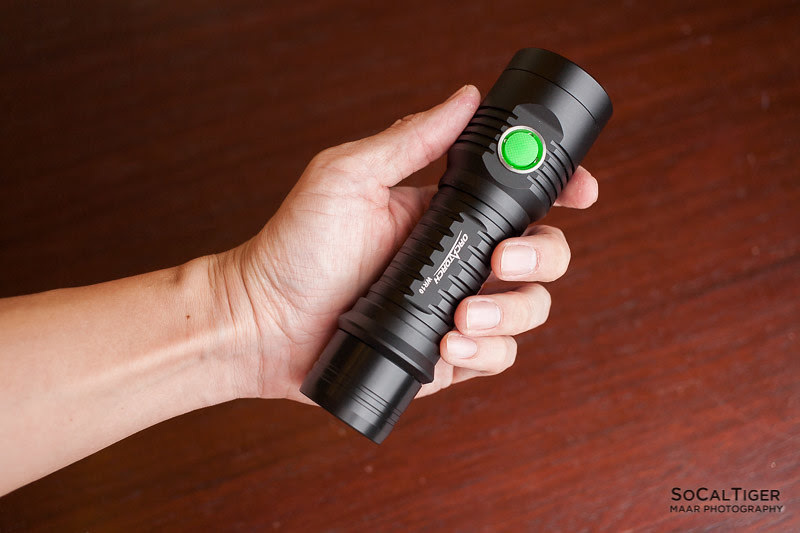 This is a great size for people looking for a flashlight with a little more mass and therefore better heat handling but without being too massive. The finish looks excellent, is easy to hold and my copy had no defects. The side-clicking UI is very easy to use and the strobe modes are very well hidden. Aside from adding the ability to configure the modes to go Up or Down, I consider the UI to be "perfect" for it's class as it is very easy to use. The beam profile is throwy and the color temperature is 6000K with no notable tint shift. Thanks for the review SoCalTiger. It looks like it would be a really nice 26650 light if only they would have put some kind of lock-out in it. It says at the amazon link that there is thermal protection, did you get a chance to check that out? Maybe I am to used to numbers a bit higher. Running a 26650 I just feel the run times and output are a bit low. The cool thing is the way it charges. How good of a host would it make to be modded? Nice! I was just asking about this puppy. Looked intriguing, but the thread got deleted, so I never found out anything about it since. I didn’t test out regulation but it didn’t really get that warm to me. 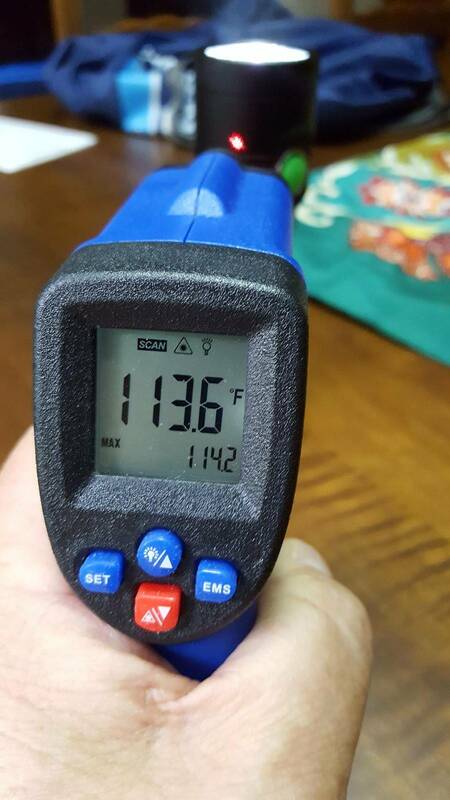 Since it is in the <=1k lumen range for this size light I wouldn’t expect it to get that hot. 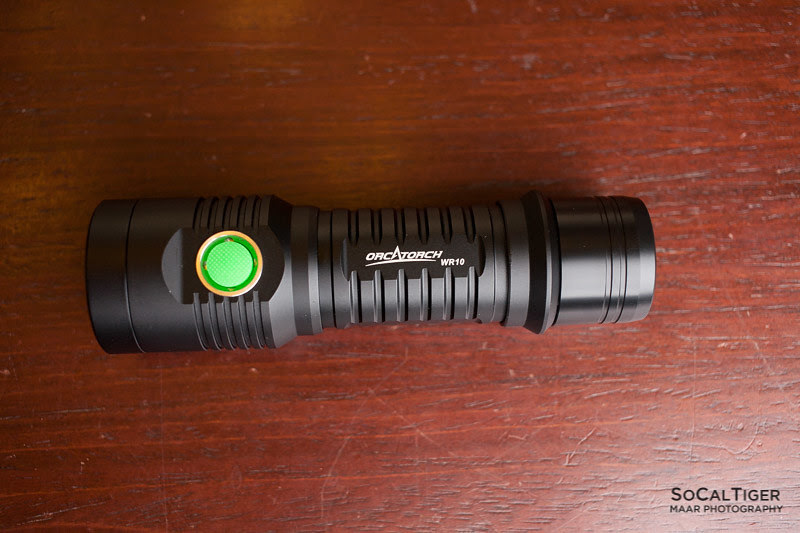 It’s a bigger host than say the C8 which also puts out a similar range of lumens stock. I really like the quality of the host, personally. Nice shape/size/design and strong anodizing. Although I believe that the bezel is glued on so an emitter swap may take some effort. Aside from that the main considerations with this host specifically would be lack of lock-out (anodized threads would have solved this) and possibly the mode order (preference depending if you prefer High to Low or Low to High). I also use lanyards frequently so lack of an attachment point is another consideration if this effects you. Aside from that the main considerations with this host specifically would be lack of lock-out (anodized threads would have solved this) and possibly the mode order (preference depending if you prefer High to Low or Low to High). Surprised at the lack of ano on the threads that prevent TCLO. Know of any reason why? 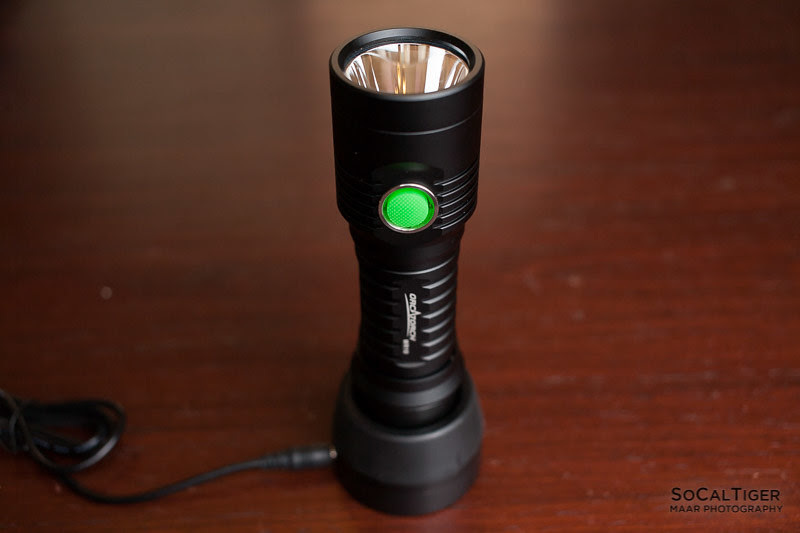 Would be nice to review this puppy, as I know people who got those dustbuster-looking lights that turn on when the power goes out. 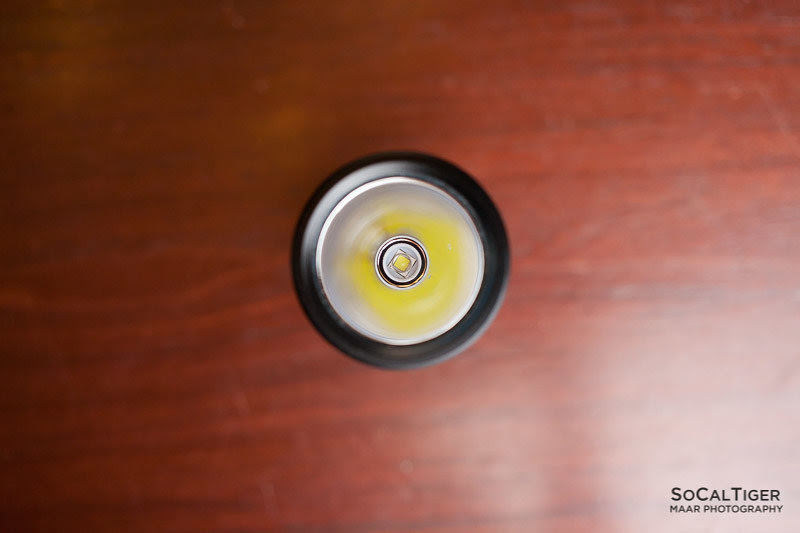 Cheap single 2V Pb-acid cell that crokes after 6mos-1yr, and with a teeny hotwire bulb that doesn’t put out much more light than a single candle. No idea why they chose not to ano the threads. Definitely would have been nice to have a physical lock-out on this light. Ever measure the cell voltage after it’s been in the charger and “topped off”? Does it charge to a full 4.2V or so? If so, that might flat-out kill the cell after not very long, as Li cells aren’t very happy when they’re continually topped-off for storage. It steps down to high after 20 minutes on turbo. It will shift to Medium when the voltage gets low, then to low and the red indicator will come on. Don’t know exactly what those voltages are though. I think the button is plenty low and stiff enough where I wouldn’t worry about accidentally activating it. It’s not really the pocket carry type of light anyway. The light is built like a tank, and there is so much mass, it really doesn’t get all that hot. Thanks all your good suggestion~~for the threads ano, I had asked our technicians for help. Hey LB, any idea or links to some data that show how continued full charge degrades the battery life? It would be the same issue with all of the olight on docking stations correct? Maybe batteryuniversity? Dunno any links offhand. I’m just parrotting what I heard about years ago, and it’s generally still agreed upon today. But just ask anyone who keeps a laptop plugged in 24/7, or electric toothbrushes in the charging stand, etc. If Li cells, they go dead fast. No idea about the Olight, though. Didn’t even know they had docking stations. I hate this crap! Not the light itself; it looks like a perfectly servicable light, fully the equal of any $20 C8. In use it does nothing any different than any other XM-L2. Since the light manufacturers have to do something other than wait for the latest from CREE, they add “features” that may or not be more useful, convenient, whatever, to sell more lights. “Gotta have wireless charging!” So the monkeys jump up in down in their cages, clamoring for this new way to perform a task that has nothing to do with improving the performance of the light. And they pay maybe 3x as much for this gotta-have feature. So the flashlight manufacturers have something new to sell, even if it does nothing that last year’s model doesn’t do. I just can’t believe how gullible people are! Dunno the price, so can’t say if it’s 3× anything. Æons ago, I took one of those shakey-lights (coil+magnet inside; shake to “charge” it), gutted it, and used the coil from that (hotglued to the end-cap) to charge a trio of sub-C NiCd cells, a constant trickle-charge and also lighting a “pilot” LED to find it in the dark (clear plastic case). It dropped into my Sonicaire™ charging base, and worked fine, even with the paltry LED it had. No idea where it is now, but if the cells aren’t ruined from disuse, I’d bet it’d still work today just fine. If you click on the Amazon link, you’ll find that the price is $69.95. For an ordinary XM-L. Free shipping, though. Gonna jump on that? Not me personally, but if someone wants/needs one, I’m not going to stand in his way. Why do people “need” a lighted tailcap? Or Cu/Ti/SS? Or anything fancy that’s not a bare-bones light? Hey, it won’t be long ‘til someone sticks in a bluetoof module that reports to a smartphone how much juice is left in the cell. Someone wants to pay 100bux for it, let him. And let whoever comes out with it first reap the profits (‘til everyone and his grandmother starts copying it). Okay, so Barnum had it right. And if people want to pay to see the Great Egress… let ‘em. 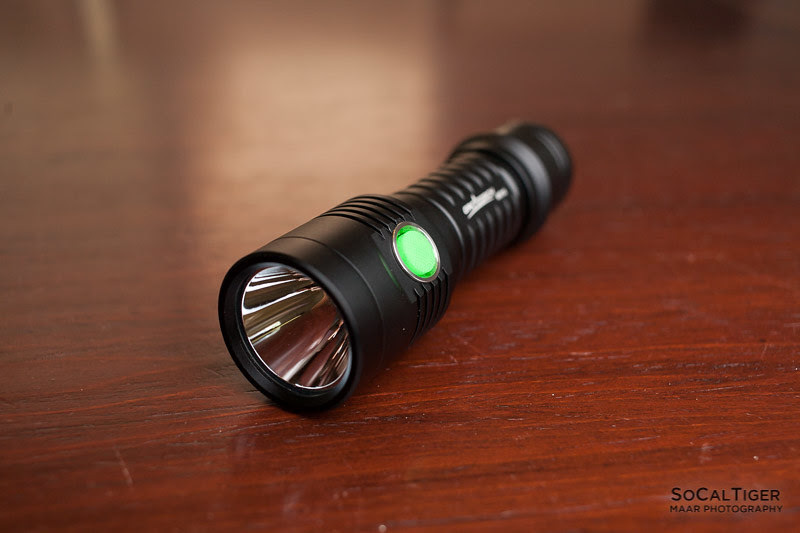 The light is much better machined than a C8 which still uses XM-L emitters, among 1 other. The wireless charging is fantastic for the family who knows nothing about high powered flashlights. All they have to do is grab it and go. No messing around with charging lithium cells, plugging in usb cables, or burning their hands on an overheated light. Nobody has a rechargeable system that works as well or as clean as this, that I know of. It’s nice light, just like the 65 other flashlights I own and don’t need, but enjoy. To each his own. “Knows nothing about high powered flashlights”. I did not realize that stuffing a battery in a charger was such esoteric knowledge. I can’t design a charger, but I think anybody with thumbs should be able to use one. To be fair, my mum needs an instruction manual on how to use a shovel. She considers that “high-tech”. She’s always wailing to me to “fix my flashliiiights!”, as she’s absolutely helpless. Of course, she leaves them turned on and lens-down so next time she tries to use one, it’s dead. She’s got like 15 of them, all crap-lights (9-LED tubes, showerhead lights, old D-cell hotwires that barely put out an orange disc of light with fresh cells, etc. ), and couldn’t load any of them with batteries if you had a completely empty table with just the light and batteries, and picture-loaded instructions what to do. Just don’t buy one Ollie. Your personal problem with this or any other object you deem useless is fixed. What I do with myself and my family is my concern, not yours. Ollie, I’m not sure how you don’t see hijacking someone’s thread, criticizing and taking personal jabs, doesn’t upset people. Has nothing to do with a flashlight. Has everything to do with the way you present your objective analysis. it tells me the mfr set out to make something of quality rather than just another $15 chinese light. the functional testing above reinforces this. i see this as a Cadillac and the $15 china cheapie a yugo. i can also see myself mounting the charger base in the truck for an always ready grab and go light with no fiddling with a charger. no one is forcing you to buy it if you cant justify it over the yugo. RobertB, OK, let’s look at that. “Better machined”. Other than esthetics, what does that contribute? anyone fully discharge one yet and time how long it takes to recover to 100%? and what is the tube id? i have a bunch of liitokala cells that are a bit on the large side.